A bit further on we went down a side alley and found "The Tea Shop". 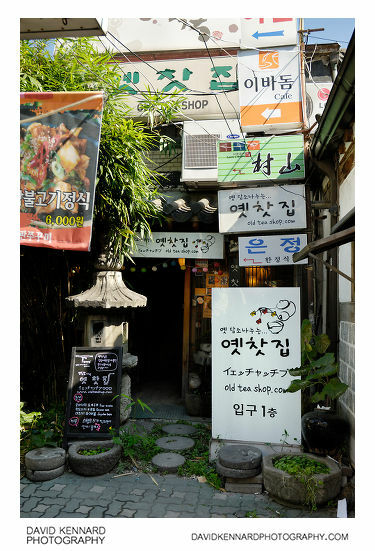 We didn't actually go in and have any tea there, but you can see some photos of inside the shop on this Korean blog: 인사동 찻집 : 대추차가 좋아지는 나이엔 인사동 옛찻집 고고씽. You might notice the shop has a large amount of signs outside, I'm not convinced they're all necessary really. 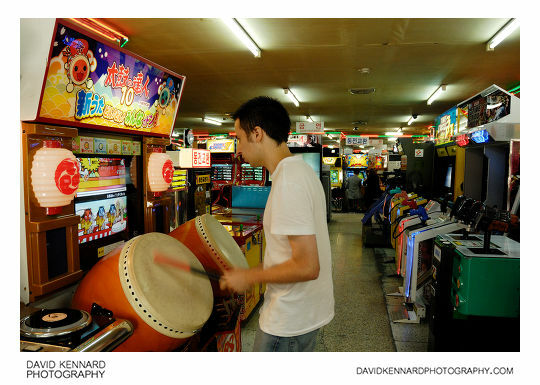 Further on down Insadong we found an arcade where my brother, who was on holiday with me, had a play on a Japanese drumming game called Taiko no Tatsujin. You can see the arcade wasn't busy on a Wednesday morning. The prices were very cheap, 500 won for modern games and 300 won for retro games like Pacman. I think 500 won was worth about 25 pence at the time. 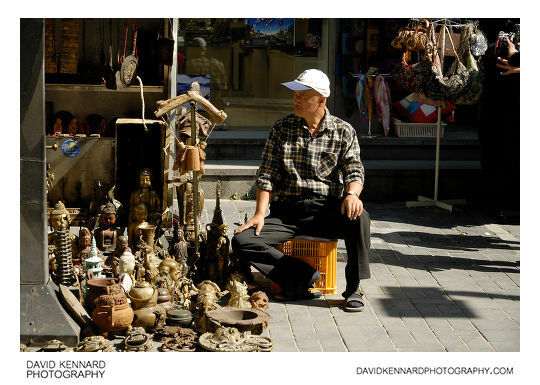 Back out on the street, a street seller was selling a variety of antiques. I think he must always occupy this spot, since I checked this location in 'streetview' on Daum maps, and the same guy was there on their 2011 streetview image. For this photo, I think the 50mm lens I was using / my camera back focused a bit, and it probably would have been better using a faster aperture like f/2 than f/5. At the bottom of Insadong was this nice wreath of flowers set up next to a tree, and nearby a guy sleeping on a concrete block. 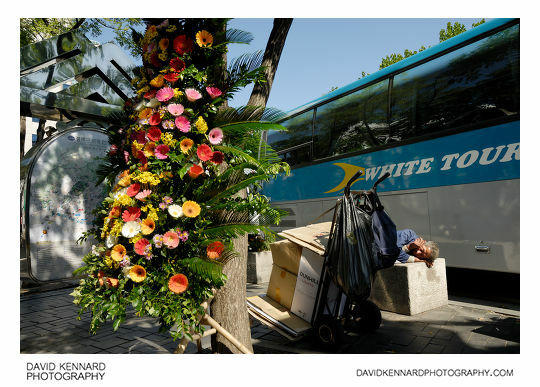 I liked the contrast between the nicely arranged flowers and the sleeping guy with his trolley of cardboard boxes. I would have the liked the sleeping man to be more prominent in the frame, but couldn't really do this while still including the flowers.